The leaves are a solid green with a band of rust where it attaches to the core. The serrated edges are extremely sharp and rust in color. The flower is a hot pink with a band of deep purple at the base. The plant self propagates creating a mass grouping. It seems to attach itself to a tree. This plant was located in southern Florida. Thank you for such a quick response. I did bring home an offspring and hopefully will succeed in its cultivation. 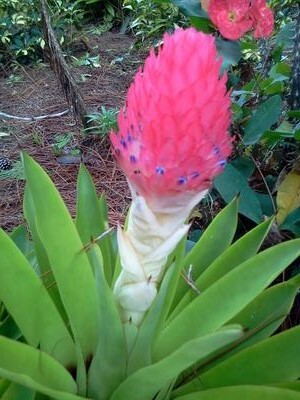 This is a bromeliad, which grow in the ground under big trees in the jungle, or even in the crotches of tree branches in their native habitat. Florida has the perfect conditions for them, being warm and humid.